I was recently contacted by a large Editor (As most of you like know I have accompanied a number of IT consulting companies and editors in their “Go to Market” with Client acquisition, (Large) Account Introductions, Alliances (notably with BIG 5 consultancies), Market Position (Forrester, Gartner, Bright Talk) and position of the “Value Proposition” (discovery, competitive analysis of market offerings, road map to realign solutions portfolio and transform sales and delivery operations, develop new market strategy and execution plans, and drive sales transformation, acquisition of smaller actors)) to help them in their go to market. 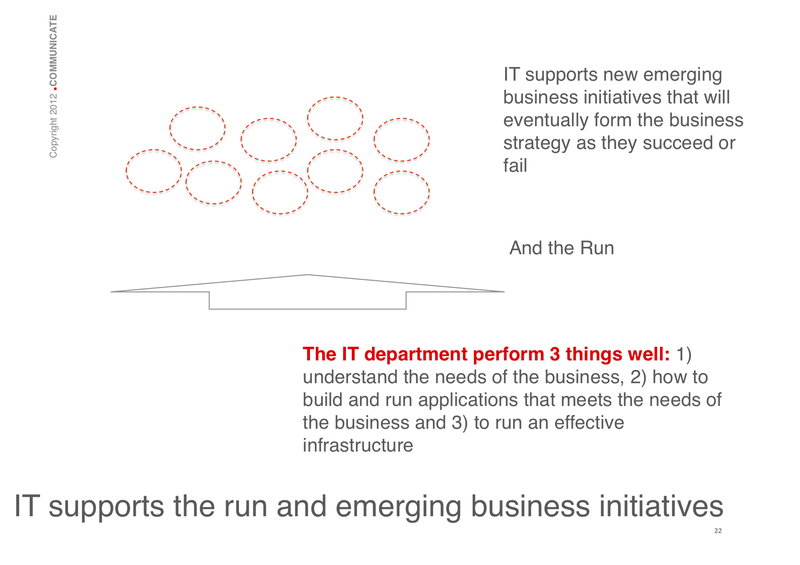 Where an IT strategy that support business objectives should demonstrate a coherent technology solution this is rarely the case. Most editors or consulting business sell adhoc projects in regards of opportunities to do so with the client. On the client side fire fighting that is to solve problems on an adhoc basis, where focus is on work arounds and throwing man hours and conceive ideal solutions on paper (encouraged by most consulting companies) leaves most businesses with a poor industrialization of business and IT processes. Clients need to step up to buy a full value portfolio of services powered by the purchase department (this is yet to be done) on the other side large service providers should leverage their international organisations to sell and deliver end to end solutions to their clients. This will also permit significant cross selling with an increase in the added value perceived (that will take the said actors out of the equation to compete on cost only). Reblogged this on The Governance Office.